Texas Sailing is pleased to host casual, beer can style events for our members to enjoy sailing and meeting other people with an interest in sailing. We meet at the picnic tables near the water at Sundancer Grill, Sail & Ski Marina about 5:45 on Friday afternoon to answer any questions that members may have about the event. We recommend skippers plan on departing the dock at 6:00 PM for their start time. Official start time is 6:30 PM. Proper etiquette is for all to return to shore to tell stories, tales, exaggerations and prizes shared at or near the Sundancer Grill after the event. During the series (six races), prizes will be awarded to members when three or more vessels are participating. The format changes from time to time so if you are joining for the first time, we recommend you contact our office to ensure there hasn't been any last minute changes. "Beer Can Races" are casual, social events that are part of the sailing tradition. In short, an excuse for sailors to go out, have some fun, with a little competition included. This is family fun. The rules are simple and we abide by an honor system with no race committee, no protests, no crying, and no whining. For more guidance, click "Learn More" to read "The Ten Commandments of Beer Can Races" created by fellow sailors on the West Coast. The "race" course begins and ends between the two eastern most "No Wake" buoys outside of Sail & Ski Marina. 1) Boats sail from the start line to Marker 14, keeping the marker to starboard. 2) Stay out of Lower Water Marks at Arkansas Bend and turn at Marker 11. 3) On return, stay out of Low Water Marks, Keep 14 to port, and head to the finish line. For complete details, click "Learn More" for larger diagram and course details. 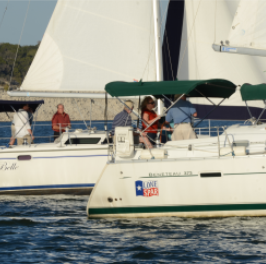 Texas Sailing Club Members' boats are provided start times based upon their boats' PHRF (handicap based upon theoretical speed). Times are adjusted with each race with time added to the previous week's winner start time and subtracted from the last place finisher's time. Confirm your start-time each week before the next race. Participants ignoring the ten commandments, complaining about start times, entering low water areas, or barging any mark will have 2 HOURS added to their start times, and be requested to buy everyone a beverage for being annoying. In other words, focus on fun and safety of crew and vessels.